PRODUCTS - Dueck Defense, Inc.
Dueck Defense, Inc. develops tactical and competitive weaponry sight systems for competitive, law enforcement and military tactical shooters. The innovative, ISO-certified products, including the Rapid Transition Sight™ and newly released Rapid Latch, provide the quickest transition possible from optical to offset iron sights while reducing reload time and shooter efficiency. 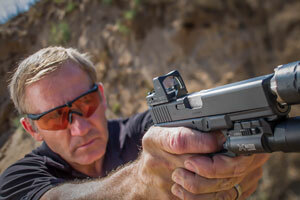 Good sights are the biggest improvement you can make to improve your shooting performance with a pistol. I designed the DFR because I needed a no compromise sighting system for my own pistols that gave a competition perfect sight picture but, in a combat fighting sight. I made the rear notch .145″ wide by .12″ deep giving a great balance, allowing for no loss in accuracy and still open enough to be very fast. The extra width and depth gives more feedback allowing you to accurately call your shots. The face of the rear sight is slightly canted rearward and matte black for a crisp sight picture and without any distracting serrations. The front of the DFR has the Dueck Defense™ blended hook with a multi direction radius. Perfect for one hand racking of the slide but without the sharp edges common on other combat sights that catch on gear and can make you bleed during rapid slide manipulation. The front sight has a slight angle to avoid catching on gear but still giving a crisp sight picture. Available in serrated, tritium and fiber optic to fit. Ultimate backup sight, no batteries, never fogs! Get your Rapid Transition Sight™ today! Q: What is the difference between Dueck Defense, Inc. Rapid Transition Sights™ (RTS™) and other offset/BUIS sights? A: The Dueck Defense, Inc. 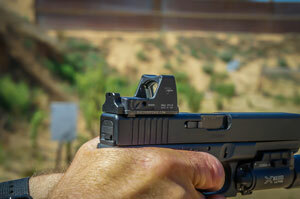 Rapid Transition Sights™ were designed to be both quick and efficient whether in a 3-Gun shooting match or a tactical L Enforcement or Military application. The standard M4/M16 iron sight design is used due to the wide familiarity with the sight picture, which results in a shorter learning curve and better efficiency when in use. The RTS™ design allows for extremely quick transition. Q: Will the RTS™ system work for left-handed shooters? A: Yes. The Dueck Defense, Inc. the RTS™ design allows for use ambidextrously, but we do offer both right and left-handed versions for your convenience. The RTS™ can be mounted on either side of the upper picatinny rail. 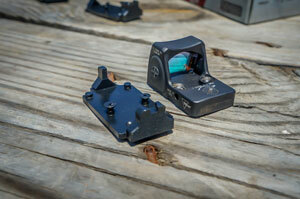 The RTS™ front sight is identical when mounted on the left or right side of your rifle. The rear functions perfectly mounted left or right, even though it’s flipped around. We have many customers running them in the left-hand set up. Some customers running the RTS™ left-handed prefer the aperture flipped so it sits the same way as in the right hand set up. Flipping the aperture around is an easy modification if you are mechanically inclined; however, Dueck Defense, Inc. does provide service to those who request to have the aperture pre-set upon ordering. Just note the requested alteration in the “comments” when ordering online. Q: What is the effective range of the RTS™ system? A: Initially the sights were used for close range (less than 50 yards), but at the 2011 Blue Ridge 3-Gun Competition, Barry Dueck found that he was able to shoot tighter groups at 200 yards with the RTS™ than with a red dot. He won the Heavy Metal division using the red dot for close targets and the RTS™ for the 100+ yards targets. The RTS™ is very versatile. Q: Is it easy to install the RTS™? A: Yes. All it takes is a flat-head screwdriver (or a small coin). See our INSTALLATION GUIDE. Q: How much time will I need to practice with the RTS™? A: You will have a good feel for the sights in just a few minutes practice. Q: How can I buy my own set of RTS™? A: Click here to visit our online STORE. Q: My normal front sight mounts on the gas block, which is lower than the rest of the rail. Does the Dueck Defense front sight mount on the same rail as the rear? A: Yes. The front sight needs to be mounted on the same plane as the rear parallel to those bore. If you want the sight mounted to the gas block, PRI mounts make an SE plane gas block which retails for $65. Q: What torque should I use on your screws? 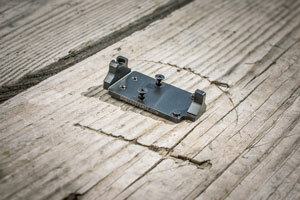 A: There is no special torque needed for the RTS™ screws. Torqueing with 15-inch pounds would be perfect, but just tighten the screw until the sight base has no movement with the gun.